When I was a child visiting EPCOT Center, one of my favorite activities to engage in was scoping out the concept vehicles in World of Motion’s TransCenter. My father has always worked in the automotive field, so I grew up around car guys, and even if their knowledge did not transfer to me their enthusiasm was infectious. Wondering what cars I would be able to talk about with them in the future drove me to explore the area in as much detail as I could. These days, the post show are of World of Motion turned Test Track seems light on futuristic concepts and high on product placement. But what if we are simply looking at the post show of today through the rose-colored glasses of yesterday? True, there was more to see and do in those early years, and concept cars appear to be an endangered species in the pavilion, but that doesn’t mean the future is less front in center than it was in 1982. In fact, I’d say today’s post show is currently delivering on the promise of tomorrow from the 1980s. Those formative years spent hovering over Hinge Cars The Lean Machine were also passed with an exhaustive inspection of The Water Engine show. The show, which featured animated characters from every walk of life, from little girls to city socialites and even a superhero and evil genius, proposing their ideas for the engine of the future. The show started with an improve version of the internal combustion engine before moving on to coal, magnetic, electric and even the water engine which utilized hydrogen. The show even featured a pair of geniuses, a coach and Michelangelo, offer up engines that combined the different ideas into a singular propulsion method. While these two may not have had all the answers, they had the right idea. Today, the showroom of Test Track is filled with the family of GM vehicles. Sitting off to one side, without much in the way of pomp, is the Chevy Volt. A car that delivers the goods pledged to us by The Water Engine all those years ago: a new style of transportation fueled by an improved combustion engine, combined with the power of electricity, in a high performance vehicle. It may not be the end point in alternative automobile engines, or even the right answer by the end of the decade, but it is a step in the right direction and shows that we are moving forward in the field. Sure, it may not fold up or stretch out like the Hinge Car my eight-year-old self dreamed of and it certainly isn’t flashy, but as an adult I’ve always appreciated substance over flash. And that may just be what the future of transportation looks like. 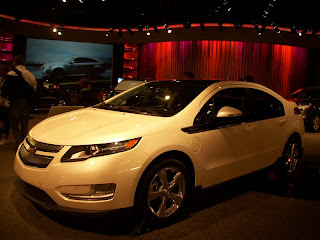 I sure do miss the glorious concept vehicles and hours of entertainment provided to me by the TransCenter, but give me the understated ingenuity of the Volt that actually solves problems, and I am a happy guy. Glad to read that there's a Chevy Volt at TT. Wouldn't it be something if the Tomorrowland Speedway were converted to electric (or fuel cell) vehicles?